For me as a young child in Communist Romania life was uncomplicated and rather plain. Sweet in its simplicity and naivety, I suppose. 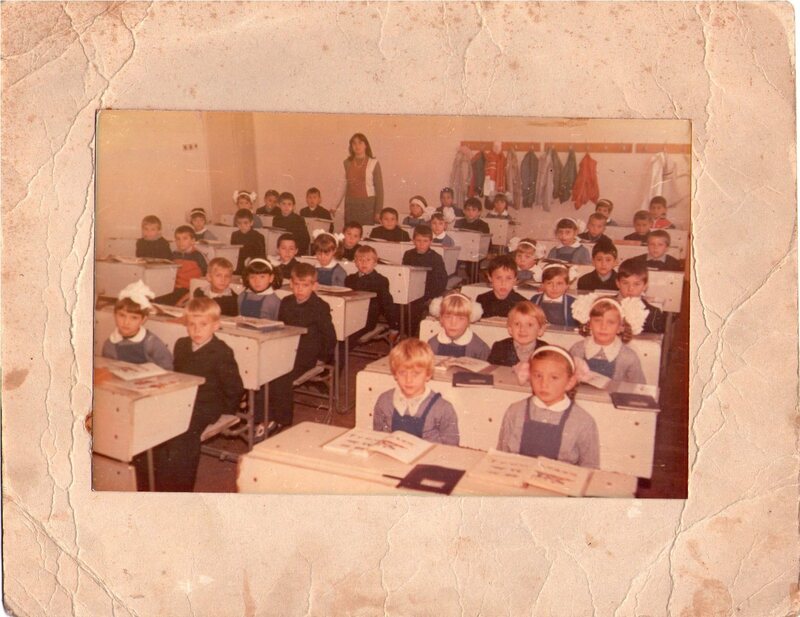 Here is a picture of my Primary One class, we looked so cute and innocent and…unsure of this whole school thing! Photo courtesy of an old school friend, as I haven’t brought any childhood pics with me when I moved to Ireland. I suppose back in the day our biggest concerns would have been making friends with our new “bench” mates, having the prettiest ribbons in our hair and impressing our teacher. I don’t recollect that particular day when the photo was taken but among the things I remember from that first year in primary school was Livia’s long hair and lovely braids and how she could already spell and read(!!). I remember making blotches in my writing book with ink and the stifling feel of my plastic uniform. I remember playing outside at break time and occasionally practicing patriotic marches and songs under the stern direction of our school principal. I remember my first school bag (made of fake leather and put to good use as a sleigh when the first snow came!). Not that we had a lot (no-one had a lot of anything back then in Romania) but we had parents who did their best to provide for us and tried to cushion the reality for us. Although I became aware of the political oppression quite early on (I was around 10) in the form of the secret police enforcing home arrests, it never affected us directly. The “revolution” came shortly after and with it a sense of initial dread, followed by relief for our parents, as soon as things settled down and a new regime was established. A peaceful childhood that we took for granted. A peaceful childhood that in this day and age is being denied to 10 million of children due to war and the devastation that ensues. Action Aid UK has launched last week a new #REBUILD campaign which intends to raise money for children in dire need due to military conflict. The charity has asked celebrities and simple people to join in and reminiscence about their childhood in an attempt to raise awareness about the issue. This post is my humble contribution towards this praiseworthy cause. As a stay-at-home mum I can’t give financially at the moment but I can give a little of my time to write about this campaign and become a voice for these children, at an hour of greatest need in their young lives. May their suffering be shortened and their lives become a shade brighter! Thank you! And thank you for stopping by. Definitely, I truly believe in education and doing our small bit in helping others! Thanks for stopping by! Oh, Jaime, I was worried that it didn’t blend it with the rest of the posts, thanks for the reassurance!